NASA selected in August 2012 the 12th mission of the Discovery program. The new mission, named InSight (Interior Exploration using Seismic Investigations, Geodesy and Heat Transport, formerly known as GEMS, Geophysical Monitoring Station), will place instruments on the Martian surface to investigate whether the core of Mars is solid or liquid like Earth's, and why Mars' crust is not divided into tectonic plates that drift like Earth's. Detailed knowledge of the interior of Mars in comparison to Earth will help scientists understand better how terrestrial planets form and evolve. InSight is led by W. Bruce Banerdt at NASA's Jet Propulsion Laboratory in Pasadena, Calif. InSight's science team includes U.S. and international co-investigators from universities, industry and government agencies. The French space agency Centre National d'Etudes Spatiales, or CNES, and the German Aerospace Center are contributing instruments to InSight, which is slated for a launch between March 8 - 27 March 2016, is scheduled to land on Mars in September 2016 to begin its two-year scientific mission. InSight is the 12th selection in NASA's series of Discovery-class missions. Created in 1992, the Discovery Program sponsors frequent, cost-capped solar system exploration missions with highly focused scientific goals. InSight builds on spacecraft technology used in NASA's highly successful Phoenix lander mission, which was launched to the Red Planet in 2007 and determined water existed near the surface in the Martian polar regions. By incorporating proven systems in the mission, the InSight team demonstrated that the mission concept was low-risk and could stay within the cost-constrained budget of Discovery missions. The cost of the mission, excluding the launch vehicle and related services, is capped at $425 million in 2010 dollars. 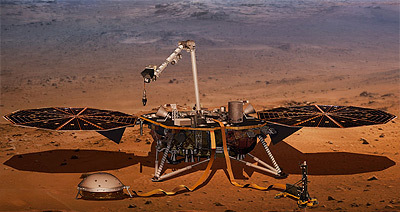 The InSight Lander will carry three instruments to the surface of Mars to take the first-ever in-depth look at the planet's "vital stats": its pulse, or internal activity, as measured by the SEIS instrument; its temperature as measured by the HP3 instrument; and its reflexes as measured by the RISE instrument. Together, the data will provide essential clues about the evolution of not just Mars, but also all the terrestrial planets. SEIS: To capture Mars' pulse, or its internal activity, InSight will carry a seismometer called SEIS to the surface of the Red Planet. SEIS will take precise measurements of quakes and other internal activity on Mars to better understand the planet's history and structure. HP3: To take Mars' temperature, a key indicator of planetary evolution, InSight will deploy a heat flow probe on the surface of Mars. The instrument, known as HP3, will hammer five meters into the Martian subsurface, deeper than all previous arms, scoops, drills and probes, to learn how much heat is coming from Mars' interior and reveal the planet's thermal history. RISE: To track Mars' reflexes, or the way it wobbles when it is pulled by the sun, an investigation called RISE will precisely measure the Doppler shift and ranging of radio communications sent between the InSight lander and Earth. By tracking wobble, scientists can determine the distribution of the Red Planet's internal structures and better understand how the planet is built. Cameras: InSight will incorporate a camera, similar to the "Navcam" engineering cameras onboard the Mars Exploration Rovers (MER), mounted on the arm of the lander that will serve to capture black and white images of the instruments on the lander's deck and a 3-D view of the ground where the seismometer and heat flow probe will be placed. It will then be used to help engineers and scientists guide the deployment of the instruments to the ground. With a 45-degree field of view, the camera will also provide a panoramic view of the terrain surrounding the landing site. A second similar camera, with a wide-angle 120-degree field of view lens like the "Hazcam" cameras on MER, will be mounted under the edge of the lander's deck and will provide a complementary view of the instrument deployment area. 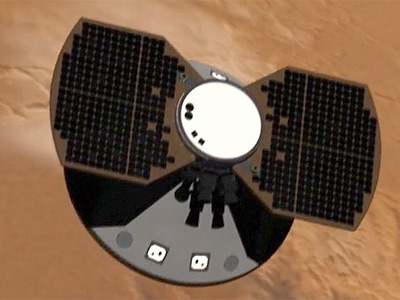 InSight will be accompanied with two MarCO 6U-cubesats, which are to provide communications relay during the landing phase, as the MRO, MAVEN, and Mars Odyssey orbiters will not be in position to receive InSight data. In December 2015 it was decided to cancel the 2016 launch, as there is a design flaw in the French built seismometer, which prevents the vacuum inside the instrument to be maintained. NASA’s Science Mission Directorate has approved in September 2016 the new launch window 2018for the agency’s upcoming Mars InSight mission. NASA estimated that this delay and the instrument redesign will cost additional $153.8 million.